What began as another example of Hollywood weirdness has turned into a global style phenomenon. Who knows - perhaps the buzz began in earnest when Steven Tyler wore feathers on American Idol. Commentators were all aflutter: What exactly were those things in his hair? 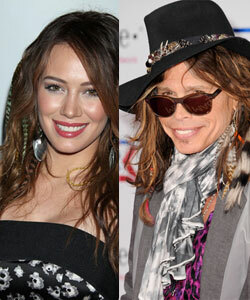 Feather extensions have also been spotted on Jennifer Love Hewitt, Cassie Scerbo and Hillary Duff. They can be worn subtly, just peeking out from under the hair, or audaciously like Miley Cyrus who went tribal with hair and body plumage in her video Can't Be Tamed. Suddenly roosters, pheasants and peacocks are looking nervously over their shoulders as their feathers are being redefined as human hair-wear... and not just by celebrities in la-la land. This hair trend is gone viral and might also available in hair salon near you - A new hot trend and a fine addition to existing feather hair accessories. What Critics Saying about this new fashion? Feather extensions use the same basic application technique as hair extensions. 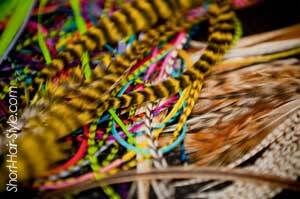 A small link crimps the colorfully dyed feathers onto a strand of hair near the roots. The feathers become part of your everyday styling routine: you can brush, blow dry, straighten, curl and pull them up into any sort of 'do. Feathers can last up to 4 months, depending on how hard you are on your hair. When they need adjusting or replacing, the link is simply uncrimped and the feathers reinstalled. The main product difference you'll encounter when shopping for feather hair is the number of feathers. Some salons install single feathers for $10 or $15 each. Others sell them in bundles of between 3 and 7 feathers, and some vendors even let you choose the colors you want in your bundle. Feather extensions can last up to 4 months, depending on how hard you are on your hair. When they need adjusting or replacing, the link is simply uncrimped and the feathers reinstalled. Hair hook for pulling strands through the link. Assortment of feather hair extensions. Feather hair extensions are a fun new fashion trend for women, men, teens and kids and a great add-on service for hair salons.